KEEP THE APPOINTMENT. Pretty common sense but in running networking groups for several years now, we have heard of people blowing off one-on-ones. Just don’t do it. Agree to a certain time period for the one-on-one and stick to a set time period (30 minutes to an hour). Bring an “Ideal Client Profile” sheet, cards and collateral materials. 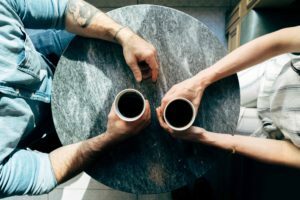 Don’t lose sight of the reason for the one-on-one – Developing a business relationship (personal stories and talking about share acquaintances is fine but don’t get sidetracked). Allot equal amounts of time for each person to talk about his/her business and the type of lead/referral/introduction he/she is looking for (be wary of the person who goes first taking up most of the time). Before you end the meeting, determine next steps/action items and a time frame. If you promise to make an introduction or share contact info, do so before the end of that business week or within two business days. By following these guidelines, you give your one-on-ones some structure, which makes it a good use of your time and that of the person with whom you are meeting. After you schedule the one-on-one be sure to confirm the meeting the morning of the appointment. If it’s a morning meeting, confirm the day before. Things come up and you want to be sure the meeting is a go. It also shows the person you are meeting with that you do value the meeting and his/her time.